The Precison Temp ShowerMate M-550 EC is perfect for the boater who doesn't want to leave the comforts of home behind when on the high seas. 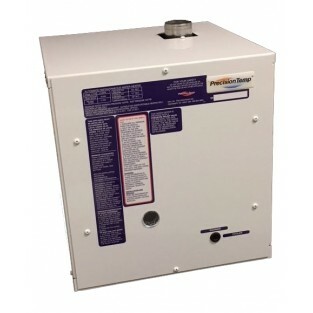 The PrecisionTemp ShowerMate M-550 EC tankless, marine water heater utilizes patented VariFlame Control technology to deliver an endless flow of hot water for the ultimate marine shower. The heater operates only when the hot water outlet is turned on. The VariFlame control system then keeps the water temperature constant regardless of the flow rate or incoming water temperature. With 55,000 BTUs—the highest hot water output in the industry—and built-in freeze protection, the M-550 EC delivers on-demand, continuous hot water—all without using engine or shore power. For the same amount of propane, the M-550 EC produces more hot water than a traditional water heater. Many people find that they use up to 50% less propane, with lower operating costs and fewer fill-ups. Its lightweight, compact, efficient and installs almost anywhere.